Tutankhamum’s tomb is considered probably the greatest discovery during the period of 1922. 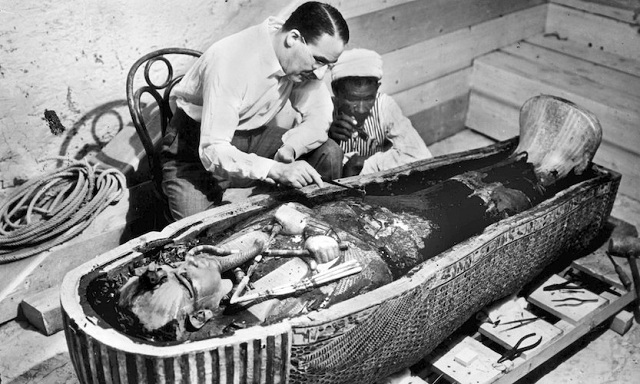 The discovery was carried out by Howard Carter together with his team. Howard Carter, a British Egyptologist had been evacuating a royal ground towards the early 20th century. It was situated on the west bank of the ancient city of Thebes. He had been short on funds in managing his archaeological excavations. He then made one more request to his financial supporter who was the fifth Earl of Carnarvon. Lord Carnarvon permitted him one more year to support him. Tutankhamum’s tomb eventually came to light with his final attempt in excavation. At the onset of his excavation, Carter observed first of the twelve steps of the entrance leading to the Tutankhamun’s tomb. Tutankhamum’s tomb was found intact which belonged to an Egyptian pharaoh of the 18th Dynasty. It was the only tomb of a pharaoh which had not been touched and identified in the Valley of the Kings. It had been found with artefacts comprising of statues and artwork of such amazing quantity that it took almost ten years to record them. In Tutankhamen’s tomb, they found not one casket but three caskets, which lay within a case of three golden caskets containing the body of the king. The outer part of the caskets had been crafted in wood with gold coverings together with several semiprecious stones. These were lapis lazuli and turquoise. However the inner caskets had solid gold. Carter in his discovery notes had mentioned that it had been covered with thick black pitch like layer which extended from the hands down to the ankles. This could probably be the anointing liquid which had been poured over the casket at the time of the burial ceremony. This had been lavishly poured in great abundance. The image of him has been portrayed like that of a god who is believed to have gold skin, bones of silver and hair of lapis lazuli. The king here has been shown in his divine form. He is portrayed holding the crook and flail in his crossed arm, which are symbols of the rights of the king to rule. According to an art critic, Alastair Sooke commented that the 1922 discovery had ignited a global spark for ancient Egypt -`A craze for Egyptian exoticism convulsed the West, infiltrating both high and low culture across the fields of music, fine art, fashion, film and furniture design’ Carter thereafter had been a popular person conducting tours in America and delivering lectures with regards to his discovery. Tutankhamum’s rule lasted for almost ten years from 1336 – 1327 BCE. Howard Carter and Lord Carnarvon had found Tutankhamum’s tomb which was untouched in November 1922 in the Valley of Kings. It is said that the mummified body of the king was surrounded by precious goods. This was discovered in his golden coffin after his burial chambers had been officially opened in the presence of Egyptologists and government officials on 17th February 1923.According to the discovery, it was observed that Tutankhamum had died when he was around 18 years of age. His end led several scholars to wonder about his death. However, it is not clear, precisely when he died. His body revealed damage at several stages which could have occurred before or immediately after his death, during the hasty mummification development, in the tomb which could be due to the chemical reaction taking place in the coffin or probably during extraction from the coffin. There are various damages envisaged on the chest and legs of Tutankhaman which indicates an accident, probably hunting or a chariot accident. Perhaps it could also be death on the battlefield. Still others state that Tutankhamu could have been murdered. Tutankhamun had been nine years of age when he was crowned the king of Egypt during the period of the 18th Dynasty of the New Kingdom. If the archaeologist Howard Carter had not discovered Tutankhamum’s tomb, we would have lost his history and would be ignorant of the knowledge of what laid in his tomb. His intact tomb revealed a wealth of objects providing us with numerous perceptions during his period of ancient history of Egypt. Overall, it took Carter and his team almost ten years to document and clear Tutankhamum’s tomb. After he had completed his work in 1932 at the tomb, Carter started writing a six-volume book. Unfortunately Carter died without completing it on March 2 1939 at his home in Kensington, London.